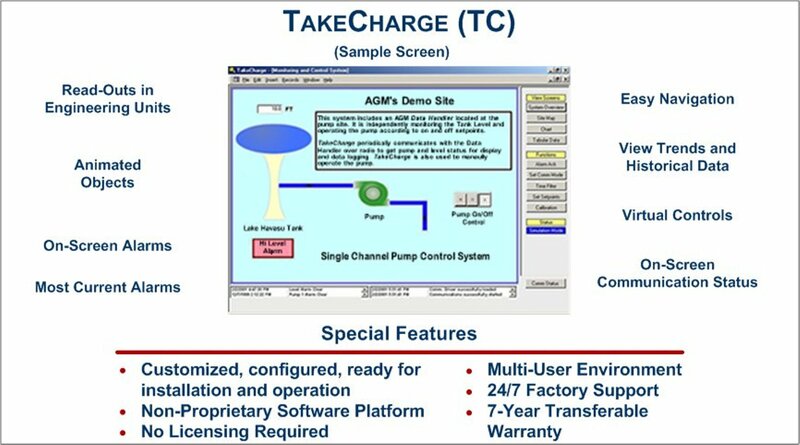 Non-proprietary TakeCharge provides the low cost solution for those PC based HMI "control-room" software & interface requirements. Customized graphics, virtual controls, reports, data recording, multiple screens and communications driver are included. Instead of Operating and Maintenance personnel making untimely trips to the field, they can view the complete system from a central location. 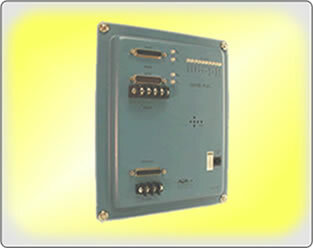 They can also remotely control field equipment using the virtual on-screen controls. No programming skills are required to use TakeCharge. It is pre-configured, ready for installation and use directly from the factory. 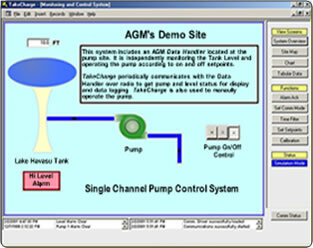 System operation with time is easily analyzed using the built-in data filters and charts. Non-Proprietary: TakeCharge is based on Microsoft's Office relational data base application Access and drawing application Visio . No site licensing or expensive keys are required. Also, TakeCharge can be viewed over a network by many users. Pre-Configured: TakeCharge is designed and factory configured based on your system requirements. Graphical User Interface: System specific, customized, multi-screen interface graphics are standard and provided at no additional cost. 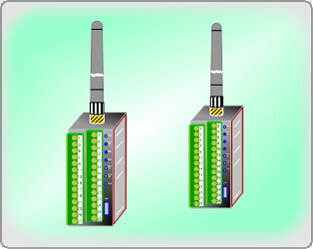 Virtual Controls: Password protected, on-screen controls allow users to remotely control field equipment. 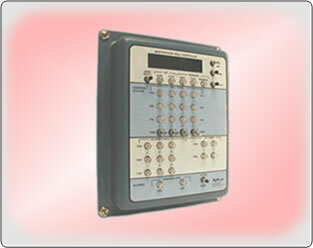 Data Recording and Display: The communications driver is easily configured to record data based on your unique and ever changing requirements. Remote Diagnostics Tool: Technical support is available directly from Tucson using a dial-up connection. The AGM Domain engineering staff is able to provide immediate support for diagnosing and resolving systemic problems. o Supports DDE communications to any DDE enable program This includes other programs in the Microsoft Office suite and many HMI software packages. The following table is a compilation of a few of the many applications that the AGM TakeCharge (TC) control room software can be applied to. If you have an application that you are uncertain as to whether or not the TakeCharge is the correct product to apply, contact AGM's Technical Support Team and they will work with you to insure that the correct product is selected for your design requirements. For those applications requiring an economical PC based operator interface, TakeCharge software provides the perfect solution for interfacing with the AGM Integrated Control Station (ICS) and the Data Handler (DH) or simular products. It is non-proprietary, easy to install and ready for use. If you have any questions, please Email us or contact the Tecnical Support Team by phone by calling 520-722-1004.